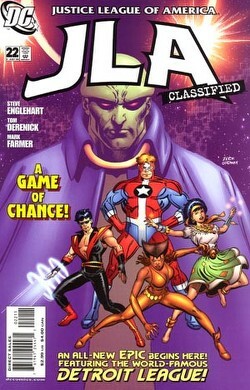 A Game of Chance - Part One: "Deal"
J'onn J'onzz has taken Vibe, Steel, Vixen and Gypsy on a camping trip in an effort to teach them to mesh as a team. Steel spends the early part of the trip thinking about the pain he went through when his grandfather had him turned into a synthetic man. Elsewhere the members of the Royal Flush Gang reunite and decide to forge ahead without Amos Fortune, whom they called Pudge back during their childhood. They form a plan to use the rebuilt Stellaration Machine to destroy the rookie members of the Justice League. After a long day of training the heroes settle in for dinner. The Royal Flush Gang attacks and manages to subdue most of the team. Only Steel manages to fight past the effects of the Stellaration Machine and the League drives the Gang back. Story - 4: It is great to see Steve Englehart getting more work these days. While I felt that Batman: Dark Detective suffered from a lousy ending it was still a nice read and this story arc is shaping up the same fashion. The Detroit era of the League has gotten some bad press over the years and some of the flack was justified. I mean Vibe was a break dancer. Sure that was cool in the eighties and all, but still it has that sense of desperation that comics get when they try to latch on to a popular fad. What Englehart has done is take that feeling that the four new heroes aren't up to the challenge of being members of the Justice League and used that as the emotional hook for the story. Actually the theme of having to prove yourself applies to both the League and the Royal Flush Gang. Englehart does an effective job of making the reader feel something for the characters and their hang-ups, even the villains. Steel was the Leaguer that Englehart chose to focus on in this issue, which may or may not change as the story progresses. I would like to see the other members receive the same treatment in the issues that follow, but maybe that's just me. Englehart really got into Hank Heywood's head and gave us an insight into how tragic Hank's life was and how bug nuts his grandfather became. That is the nice thing about this title. It gives the current comic reading audience a glimpse into what the League was like in days gone by and even though some of the characters may have been less than stellar they're still worth examining. Art - 4: Tom Derenick and Mark Farmer's art was a good match for the story Steve Englehart produced. The style was clean and smooth and the storytelling was strong. The action came off well and the flashback scenes were very disturbing especially the almost 3-D effects of Hank Heywood's grandfather wielding the surgical saw. A solid job all around. Cover Art - 4: Overall this was a nice cover. Mike Zeck and Jerry Ordway are both fantastic artists but there is something rather strange about their combined efforts. The characters look a little off somehow. Nothing major, just something I can't quite put my finger on. The art should definitely attract attention though given the reaction that some fans have towards this incarnation of the Justice League.